Emmanuel Steward once said that Lennox Lewis (Linear Heavyweight Champion 1998-2003) had the potential to be the greatest heavyweight boxer of all time. Who could forget the crushing right hand that destroyed Hasim Rahman? On that night we saw the type of devastating heavyweight that Steward had envisioned. Lennox fought with an inspiration and focus that came only against a foe that he deemed to be worthy. On such nights Lewis appeared to be nothing but the epitome of the heavyweight destroyer. Razor Ruddock, Tommy Morrison, Andrew Golota, Michael Grant, Hasim Rahman and Mike Tyson were all gunned down like gangsters in a drive by shooting. Lennox Lewis displayed the talent, determination, and punching power of a truly great heavyweight in regaining the heavyweight championship of the world when he beat Rahman in their highly anticipated rematch. Lennox belongs to an elite group of Floyd Patterson, Muhammad Ali, Evander Holyfield and George Foreman as the only men to ever regain the linear heavyweight title. 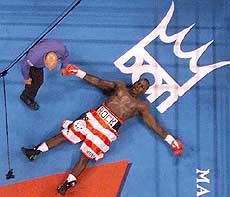 Against Hasim Rahman we saw an aggressive Lennox who came out and backed his man up with a powerful left jab. When Lennox jab is "on" it is one of the best I have seen in the heavyweight division live or on film and is comparable to that of Joe Louis and Sonny Liston. It was said that Joe Louis left jab was equal to an ordinary heavyweights right cross. 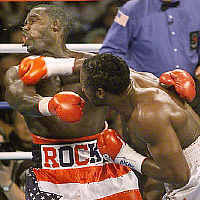 No less could be said of the left jab of Lennox Lewis on the night he regained the heavyweight title. As early as the first round Lennox buckled Rahman's knees with a left jab to the chin. His jab also opened a cut over Rahman?s left eye. After two rounds it was apparent the story of the fight thus far was Lennox Lewis jab. Lewis ramrod like left is what set up the devastating knockout that eventually came in round 4. If Lennox jab was a hammer that pounded his opponent like a nail on the head, then his awesome right was the wrecking ball that brought down the house. Lennox has one of the most powerful right hands in heavyweight history. It is not an unfair comparison to state that Lewis right hand is the equal of men such as Mike Tyson, George Foreman, Rocky Maricano, and Joe Louis. Lewis proved that his right hand can absolutely annihilate any heavyweight that he can hit cleanly with it. Men weighing 230 to 250 pounds were chopped down like a lumberjack laying his axe to the root of a tree. One right hand from Lennox could leave the ringside announcers screaming "T-I-M-B-E-R."
Lennox was not a one-dimensional fighter, but often demonstrated exquisite boxing skills. Against Evander Holyfield he showed an improved defense and ability to fight well on the inside and the ability to neutralize his opponents strong left hook. In his bout with the heavy-handed David Tua he outclassed his opponent with superior boxing skills from the outside. It is from long range where Lennox truly shined. Lennox had the ability to dominate fighters by keeping them at arms length with his accurate and powerful jab, which came at the end of an 84" reach tying him for second place for the longest reach among linear heavyweight champions. It is from this punching range that he also launched his sizzling right cross. Lennox strengths, his reach, his long powerful left jab, his crushing straight right hand, and his ability to move, box, and set up his opponents make him comparable to the great heavyweights of the past. If there was a knock on Lennox it was the quality of his chin. This is an important category, especially among heavyweights. Lewis was knocked out twice by strong inside punchers, Oliver McCall and Rahman in their previous encounter. The record also shows however that he has avenged both of those defeats. Many other great heavyweights have been knocked out. Jack Johnson, Jack Dempsey, Joe Louis, Sonny Liston, Joe Frazier, George Foreman, Mike Tyson, and Evander Holyfield all have suffered official knockout defeats. Of the "all time greats" only Rocky Marciano can claim to have never lost, and among the other heavyweight champions of history only Marciano and Gene Tunney have never been stopped. As Lennox has said this is heavyweight boxing and anyone can get knocked out on a given night. The other criticism of Lewis is that he didn't always fight with the same intensity for every opponent. This is undoubtedly true. He struggled with strong but unskilled Ray Mercer in mid-career and later against inferior Zeljko Mavrovic. However every great heavyweight has struggled with lesser fighters. Joe Louis lost early to Max Schmeling and struggled with Billy Conn, although both were world champions. Rocky Marciano was lucky to win a very close fight against Roland LaStarza and was down early against "old" fighters in Jersey Joe Walcott and Archie Moore. Muhammad Ali struggled with Doug Jones, was nearly flattened by Henry Cooper and had trouble with Jimmy Young all lesser opponents. Larry Holmes was brought to the brink of destruction by Mike Weaver, was nearly sent to la-la land by Renaldo Snipes, and barely edged Tim Witherspoon. All great fighters have these types of flaws on their record that can be highlighted for critical evaluation. Lennox Lewis legacy fight was against Mike Tyson, a fight that a number of boxing observers thought that Lewis would lose. The reasoning behind that was twofold 1) if lesser skilled punchers such as McCall and Rahman could knock out Lewis then Tyson certainly could and 2) Tyson never failed to hurt any opponent even in fights he lost (up to that time). But such was not the case. I accurately predicted the likely outcome writing, "The early prediction here is for Lennox to avoid the early bomb and frustrate Tyson from long range with his jab ala Tua. Lennox punishes Tyson over the course of the fight and wins by a late round knockout" was my prediction before the fight. Tyson could not, in fact, get past Lewis left jab and took a solid thumping before being stopped in 8 brutal rounds. By halting Tyson Lewis had won his most significant historical fight. In his final bout before retirement Lewis faced Ukranian born giant Vitaly Klitschko who at 6'7" was "bigger" than Lennox. Both men accepted the fight on short notice and the lack of conditioning may have affected the older Lewis more than the challenger. It turned out to be a real war for 6 rounds. Each man absorbed the best punches of the other. The difference in the fight was a sharp right hand by Lennox that badly cut Klitschko. A faction of fans downplayed Klitschko's loss to Lewis, but the fact remains that Lewis threw a punch that was intended to do damage and it did. It is not insignificant. Cuts win fights in boxing. How does that not count? Did the cuts that Muhammad Ali inflicted on Henry Cooper in their fights somehow not count? It doesn't matter who was ahead on the scorecards. Billy Conn was ahead on the scorecards against Joe Louis, but he was hit by punches intended to damage and was knocked out. If you quit due to injury, your body doesn't hold up and you can't finish the fight, sorry, but that is a loss for Klitschko and a win for Lewis. Beating Evander Holyfield, Mike Tyson, David Tua and the top ranked Vitaly Klitschko who would succeed him as champion, firmly established Lennox Lewis as the best heavyweight of his generation. How does Lennox compare to the all time greats? He defeated every fighter that he faced, no other heavyweights other than Gene Tunney and Rocky Marciano can make that claim. He is one of only 5 men to regain the lineal heavyweight title. Only Joe Louis, Muhammad Ali and Larry Holmes won more "title" bouts than Lennox Lewis, dating from his days as WBC champion. In terms of quality of opposition Evander Holyfield, Mike Tyson and Vitaly Klitschko are better than Ken Norton, Earnie Shavers and Gerry Cooney who are the best fighters that Larry Holmes beat. Lewis next tier of competition Razor Ruddock, Ray Mercer, Tony Tucker, Oliver McCall, David Tua and Tommy Morrison are better than most heavyweight champion's competition outside that of Muhammad Ali. In terms of ability Lennox had the powerful jab and the devastating right of a Joe Louis combined with the size and mobility of a Larry Holmes. Lennox can command the ring center, and is a mobile boxer who can outfox, out-think and outbox most any foe. Lewis was like a chess champion who can command the ring with the same consummate skill that Bobby Fischer had over the chessboard while being capable of attacking with the intense ferocity of chess champion Gary Kasparov dominating his opponents in the opening, through the middle-game and finishing them with a thunderous combination. Indeed Lennox Lewis, because of his size and power, would be a threat to any all time great boxer one cares to name. Cox's Corner rates Lennox Lewis among the 10 greatest heavyweights of history.